The walls of John Johnson’s basement music room at his Sandy home are not decorated with autographed photos from the many musicians he’s worked with during his nearly 30-year career creating and selling guitar-effects pedals as the co-founder of DigiTech and DOD Electronics. Rather, there are pictures of boats. There’s Sassafras, a sailboat named after the Bubble Puppy tune “Hot Smoke & Sassafras,” and Rolling Thunder, whose namesake is Bob Dylan’s Rolling Thunder Revue, and Nasty Habit, named for a former Salt Lake City band. Johnson is a sailor—“I’m hard-hard-core into it”—and has raced and competed around the world throughout his stint in the rock & roll biz. He turns from the pictures, takes a seat by a stack of amplifiers—most bear his brand name, Johnson Amplification—hands over a piece of paper, and says, “I could call any of these guys right now.” Eddie Van Halen, Randy Bachman, Eric Burdon, Steve Vai, Skunk Baxter, Geddy Lee, Lee Ritenour and so on; it’s a bona fide list of six-string legends. Since founding DigiTech and DOD in 1974, Johnson has worked—or, maybe, created magic—with them all to develop an arsenal of guitar effects. 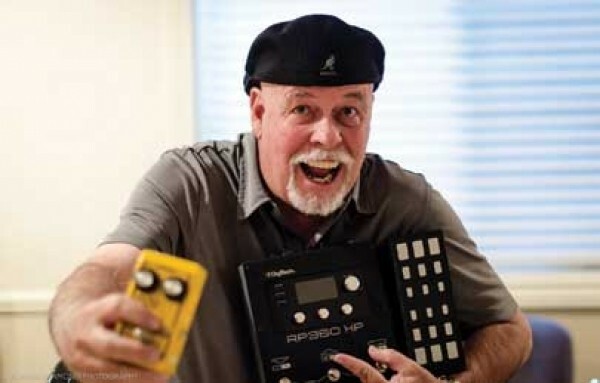 Johnson won’t accept responsibility for inventing the guitar-effects pedal—or stomp box—because unbeknownst to him and his former business partner, David DiFrancesco, Electro-Harmonix and MXR were doing the same thing on the East Coast in the early ’70s. He will, however, claim many firsts. In the world of guitar effects, Johnson says that DigiTech created the first digital-delay pedal (PDS 1000, 1984), digital-reverb pedal (Pedalverb, 1986), multi-effects rack-mount processor (DSP 128, 1987), multi-effects floor controller (RP1, 1988), pitch-bending pedal (The Whammy, 1989), polyphonic vocal effects (The Vocalist, 1991)—the list goes on. “Most of my stuff came from talking to musicians, traveling, playing in bands, listening to people and putting two and two together,” Johnson says. “I’m not a genius. There was no epiphany. But I listen. If you listen, people will tell you what they want. And if you make what they want, they’ll buy it. It’s as simple as that. You don’t have to be a rocket scientist to figure that out.” The rest is history; Johnson has sold nearly $2 billion retail dollars worth of product, he says. Johnson is a storyteller. Over the course of 45 minutes, he talks about psyching Eddie Van Halen up with tequila shots to take the stage after Albert Lee; jamming with The Guess Who, which led to the invention of the DOD 250 preamp pedal; and chatting with Steve Vai, who wanted a way to sustain a pitch bend, which led to the creation of one of the longest-selling pedals of all time, The Whammy. However, in an interesting turn of fate, DigiTech has brought Johnson back on as a creative consultant. At Johnson’s feet is his first creation since returning, a yet-to-be-released sleek black box of effects goodness, the DigiTech RP360XP. “That box is smarter than what was in Apollo 11,” he says with a chuckle. Johnson picks up a pearl-white Stratocaster to demonstrate and whirls through effects like jazzy slapbacks, punk blasts and arena-rock crunches with only a few foot clicks. My band, The Ferraries, won a battle of the bands, so we were asked to perform for a “special guest band.” There must have been 10 or 12 bands there, and we played, like, fifth. We played “Satisfaction.” Later—and no one knew it would be them—out came the Rolling Stones, who also played “Satisfaction.” It sounded like I was playing a kazoo, and they were playing an orchestra [laughs]. We were playing at a battle of the bands at the old Rialto Theatre on south State Street. The Animals were passing through town on their way to Los Angeles to record this new single, and they pulled up to the theater in this old, rickety van and listened for a bit. Then, Eric [Burdon] and the guitar player got onstage and played “House of the Rising Sun,” acoustic style. Who knew it would become such a hit? I was playing at a club, The Crow’s Nest, and The Guess Who were playing in town, too. Just around closing time, three of the guys from the band came in. I had a key, because we practiced there, so we jammed all night long. Randy [Bachman] said he wished he had his Herzog, which is like this amplifier-into-another-amplifier thing, and it’s the sound on “American Woman.” That sound is why we developed DOD’s first preamp, the DOD 250. I’ve actually opened for the Beach Boys several times at the Pavilion at Lagoon. We were there when they played “Good Vibrations” for one of the first times. The record had barely played on the radio. It was mind-blowing with the arrangements and the theremin. It was so unique for the time. Even though the Beatles had already done Sgt. Pepper’s, it was like, wow. I always liked Blue Oyster Cult. We really hit it off, and I got to know Eric Bloom and Buck Dharma, because we did a lot of modifications to their DigiTech products. It’s odd for me to be from Salt Lake City and to have met all these people and to have played with them one on one. It’s really humbling.